This report primarily covers uncoupled cyclohexanol/cyclohexanone (not captively consumed). Most cyclohexanol/cyclohexanone (over 95%) is consumed captively on site for the production of adipic acid and caprolactam (over 95%), so only a small amount enters the world’s trade markets (cyclohexane, a precursor, is more widely traded). Less than 4% is consumed in markets other than nylon. This includes use as solvents for paints and dyes, in pesticides, and as an intermediate for pharmaceuticals, films, soaps, and coatings. Cyclohexanol/cyclohexanone is produced as a mixture, resulting from the catalytic oxidation of cyclohexane. This report discusses the product that is not consumed captively and is available in the market, referred to as uncoupled cyclohexanol/cyclohexanone. In 2016, 55% of global uncoupled cyclohexanol/cyclohexanone was produced from cyclohexane, 31% from phenol, and 14% from cyclohexene as feedstock. Phenol is increasingly used as the feedstock because of its availability as a cheaper alternative for the production of uncoupled cyclohexanol/cyclohexanone. Asia, mainly China, accounted for 65% of the world capacity in 2016, driven by the region’s growing demand for nylon, which drives the demand for caprolactam and adipic acid. The cyclohexanol/cyclohexanone mixture used for adipic acid manufacture is referred to as KA oil (for ketone-alcohol). A caprolactam producer would much prefer to use cyclohexane or phenol directly and make its own captive cyclohexanol/cyclohexanone, as it is more economical. China, Japan, and Taiwan are the largest uncoupled cyclohexanol/cyclohexanone production centers, with close to 80% of global production located there in 2016. By 2021, this share is expected to be close to 85%, reflecting the significant nylon demand. Western Europe had the second-largest capacity in 2016, with local production sufficient to cater to the declining domestic demand. By 2021, Western Europe’s production is forecast to decline and will represent only 10% of the global production, less than the 15% it accounted for in 2016. China represents 53% of the world capacity; most of the top producers of uncoupled cyclohexanol/cyclohexanone are in Asia. In 2016, Shandong Haili and CPDC controlled 18% of the global capacity. Major world consumption areas are Western Europe, China, Taiwan, and Japan. Use for caprolactam production accounts for the most significant part of cyclohexanol/cyclohexanone consumption; the remaining demand is mainly for adipic acid production and use in solvents. Demand for uncoupled cyclohexanol/cyclohexanol to produce caprolactam has been increasing, and during 2014–16, overall demand in caprolactam increased from 60% to 65% of total demand. Overall, there is global overcapacity for uncoupled cyclohexanol/cyclohexanone, thus more availability in the market. Caprolactam producers have adequate availability of uncoupled cyclohexanol/cyclohexanone in the market, which limits the dependency on other precursors for caprolactam production. Because of the excess availability in the market, demand is forecast to grow moderately in the next five years. China will continue to shape the global market for uncoupled cyclohexanol/cyclohexanone. Global uncoupled cyclohexanol/cyclohexanone consumption is expected to increase at an average annual rate of 2.0% during 2016–21. Demand in caprolactam is forecast to increase to 68% of the total demand by 2021. Demand for uncoupled cyclohexanol/cyclohexanone is influenced by the Asian/Chinese market primarily because of the caprolactam and adipic acid production in the region for manufacturing nylon 6 and nylon 66. 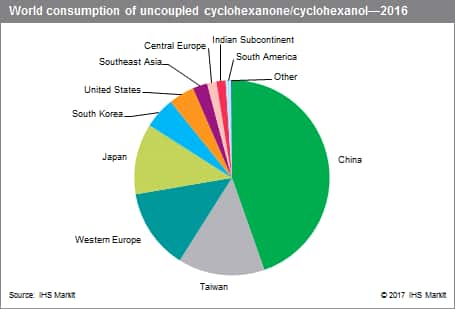 China alone will represent 52% of the global demand for uncoupled cyclohexanol/cyclohexanone, up from the 45% it represented in 2016. The United States and Western Europe are the only other large players for the uncoupled product in the market, as much of the cyclohexanol/cyclohexanone these regions produce is consumed captively and is not available in the merchant market. The market in Western Europe is larger than that in the United States, although a strong decline in demand is anticipated in the wake of declining consumption for caprolactam and adipic acid.